All prices are in Canadian dollars. We use the total number purchased (ELM622P + ELM622SM) for the calculation. 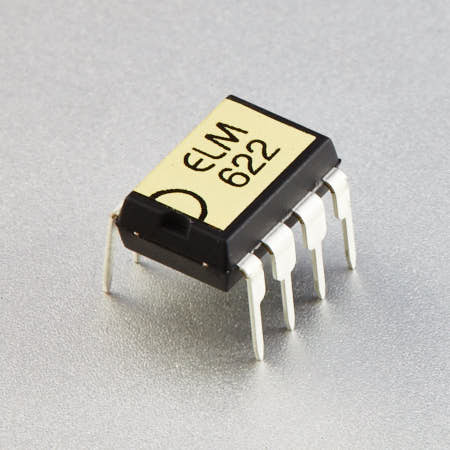 The ELM622 is an interface circuit for converting infrared control codes to an eight bit serial format. This device is well suited to applications that only require occasional input from humans, or where a hidden interface is desired. When connected to a standard infrared receiver module, the ELM622 continually scans the data stream for Sony® television control codes. If detected, the codes are retransmitted serially, with hardware handshaking. This data can then be used directly by logic circuits, or suitably buffered and transmitted on a standard RS232 connection. For convenience, some of the control codes are translated to their ASCII equivalents before retransmission, allowing direct display of the common control signals on an ASCII terminal. Many products that currently rely on a keyboard for input can benefit from the small size and simplicity that an ELM622 provides, and several others are likely to benefit from the at-a-distance control that this circuit offers.